Pretty and quirky, the Little Chapel is tiny yet attracts many visitors who come to admire what could be the smallest chapel in the world. 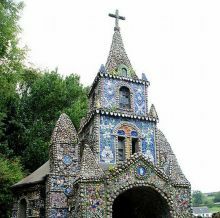 Completely covered in local shells, broken glass collected around Guernsey, and other colourful stones, the Little Chapel is as much a curiosity as a work of art and definitely deserves a visit during your stay in Guernsey! The chapel was erected during the early part of last century by Brother Déodat – one of the Brothers of the Christian Schools – who tried to build his own version of Notre Dame Grotto in Lourdes. This didn’t go without difficulty and the Chapel you see today is actually the third and final version. The second building had to be demolished after being too small to accommodate the visiting Bishop of Portsmouth! Located close to Guernsey west coast, the Little Chapel is situated in Guernsey’s only landlocked parish. The Little Chapel was never just a tourist attraction and still welcomes worshipers. Now in the hands of a private girls’ college and run by a charitable trust, the Little Chapel relies on donations to keep up with repairs and maintain the site in a suitable state for all to enjoy. This entry was posted in Places to Visit and tagged The Little Chapel. Bookmark the permalink.